« With a dream for a “second act” business, this couple is inventing their future. 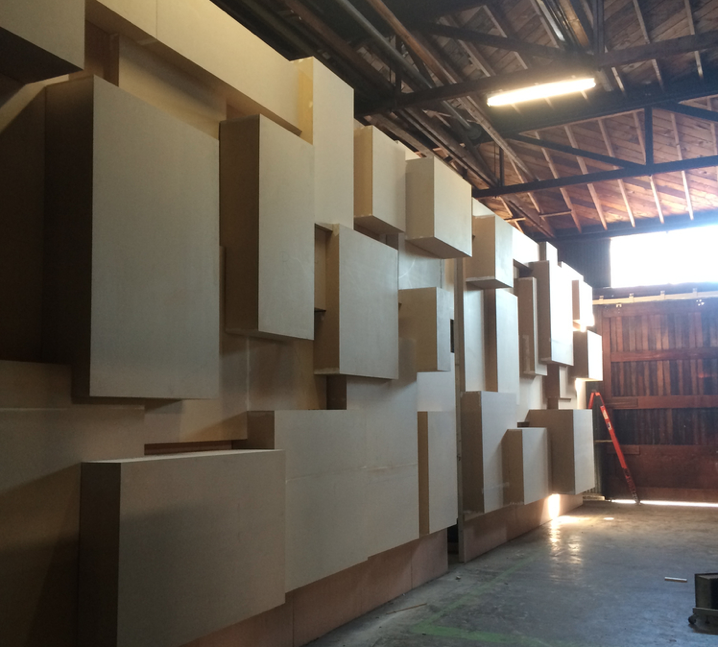 John Murray Productions of Oakland, California, is a full service event planning and production company specializing in scenery and stagecraft for corporate clients, focused on designing and producing innovative, memorable, and cost effective special events. Just a brief glance through their gallery of work and you see that John and his crew of 12 graphic artists, carpenters (doubling as welders) and producers have taken the notion of creating “signage” to an entirely new level. Here are a few snapshots of their installation at The Host Analytics World 2014, at the SFO Marriott. John Murray Productions worked with Seamless Productions to produce the set and lobby branding environment. 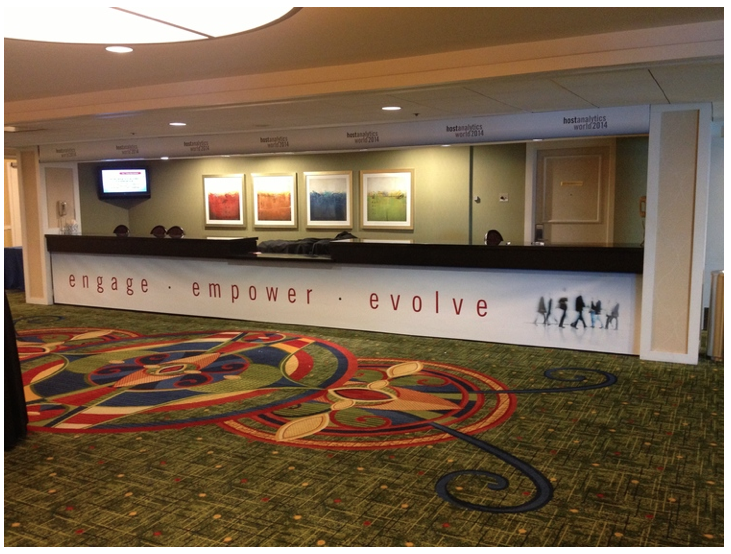 The event’s theme title – engage, empower, evolve – served as the focal point of the 15′ x 80′ graphic set, with glo walls flanking the 9′ x 16′ screens. 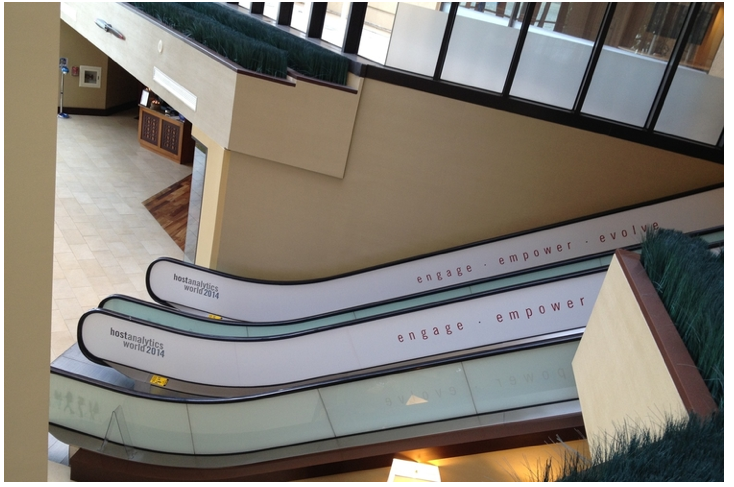 The hotel’s escalator repeated the theme with a branding treatment that covered the entire 4 sides, as well as a custom registration area, all printed on JMP’s large format eco-friendly latex printer. I spoke with John Murray by phone recently about his company’s work. MB: John, give us an idea of what your production shop is like. JM: Well if you think about it, this exhibition business that we are in really boils down to being a combination cabinetry-and-signage business. You’re either creating “boxes” of some kind to mount things on, large areas on which to project videos and other graphical elements, or a combination of the two. So our scene shop is really a cabinet shop at its core, with all the traditional tools you’d expect — table saw, band saw, drill press, chopsaw. Plus in recent years we’ve added our ShopBot 96 X 48 PRSalpha tool with a spindle, and we run the [you know what!] out of that tool day and night… We also have invested in an 8ft-wide latex printer, and have a complete backdrop painting facility. This is unique to Northern California. Actually the space we’re in was built back in 1928 as a scene shop for local theater companies. MB: Can you describe your work process? JM: Well it depends on what stage the production is at when we come on board. We’re often referred by companies that do video development and projection, and they’re in need of a scenic source after the video/lighting/sounds pieces of the project have already begun. Sometimes we’ll receive highly detailed CAD files, other times just pencil sketches. In nearly every case we have to create build drawings. We prepare the details in Vectorworks, and ultimately bring it into CAM, but along the way there is a lot of back and forth collaboration between us, the rigging crew, the lighting crew and projection crew. 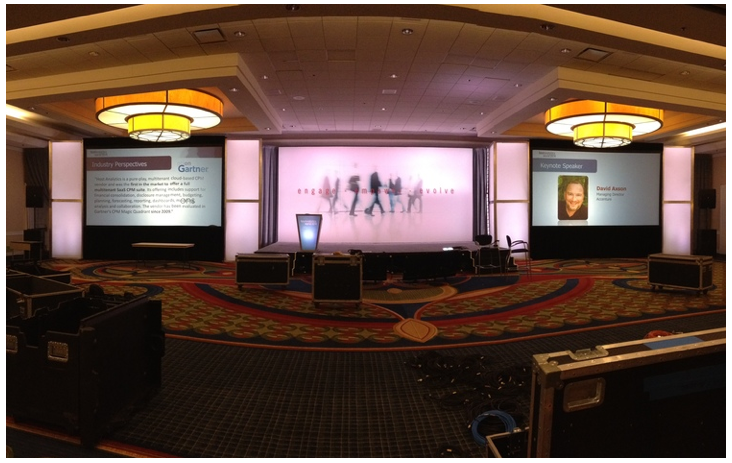 In this special events/corporate theater world Vectorworks is the go-to program. It has plug-ins for lighting designers so they can use it for their conceptual drawings. MB: What’s a recent highlight to share? JM: Well this one is pretty interesting, as you’ll see. 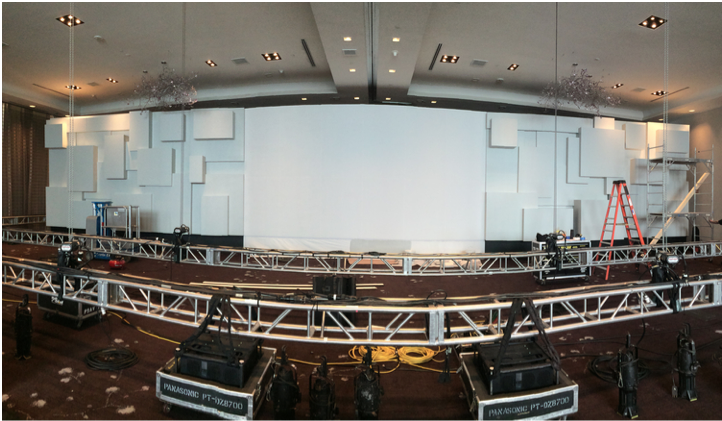 Immersive Audio Visual approached us with a pixel mapping project for the 2014 Kaspersky Cyber Security Summit. We were hired to create scenery on which a video from Kaspersky Cyber Security would be projected. The video was designed to dramatize the technological process of image-mapping, and made use of multiple focal lengths to create its images. So they needed a projection surface which itself was multi-dimensional! With just 10 days to accomplish the design-build, and the provided Sketchup drawing, our work was cut out for us. First just check out the video, it’s pretty cool…. MB: I understand that you’ve been involved with Chevron’s efforts to support STEM education? JM: That’s right and actually it’s a project that’s near and dear to me. I earned my B.A. in Biology, and assumed when I got out of college I’d be combining my love of science with my passion for building to go to work in a museum creating educational installations.. Well, about 8000 corporate logos later… I’m having this tremendous opportunity to build STEM Zones. This started about three years ago, when we were approached by Chevron to help them re-make their golf sponsorship events into STEM awareness events. Typically at golf tournaments, there will be corporate hospitality areas for hosting clients and educating them about the company. 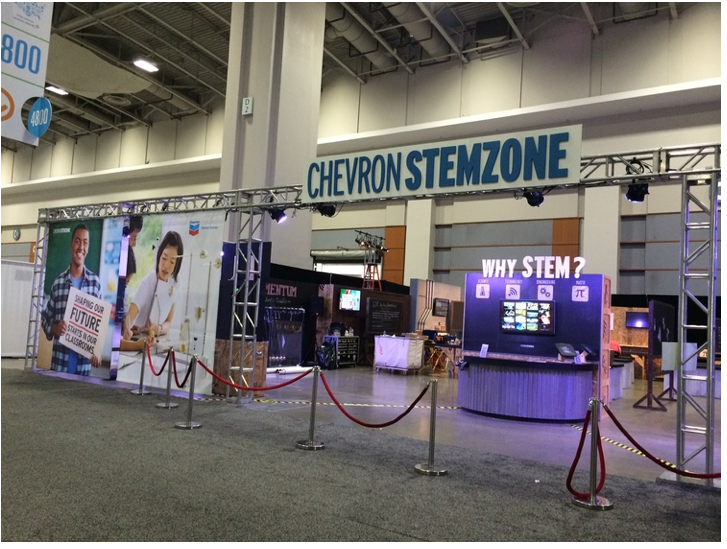 Chevron wanted to make it a highly interactive area where they’d clearly promote their interest in supporting STEM education. The first STEM Zone installation we did was to create a TV studio environment that showed people all about the technology behind creating a TV broadcast. The place looked as though it was built by kids as a cross between a clubhouse and mad scientist’s lab! Since then we’ve created “STEM behind sports” installations, demonstrating the physics behind golf, and now we’re working with the NBA on the Science of Basketball, the Giants on the Science of Baseball, the 49ers on the Science of Football. And most recently we attended the USA Science and Engineering Festival which had presences from Chevron, Project Lead the Way and FabLabs. So it’s a very exciting time for us, getting involved in supporting STEM. John Murray Productions uses a full-size ShopBot PRSalpha tool. You can learn more about it here. We’d love to hear about new and different applications for ShopBot Tools. Add your comment or get in touch using ShopBot’s Contact Form.